When you remodel your kitchen, then the first thing you look out for is a good quality kitchen countertop stone that not only looks good, but also give you really good features. The markets for quartz countertops Edmonton has grown a lot in the last few years and now you have many choices to choose from. What make the quartz countertops as one of the most favoured options for the countertops are their price and the advantages they have on offer. If you are going to compare them with the granite countertops, then they cost you a lot less but offer you more benefits. Sounds like a deal then? Well, it is. The first major advantage that you have with the quartz countertops is their price. So if you are someone on a budget or if you have a very big kitchen slab that will require you to put a very big slab of stone, then you can easily go for the quartz, as it offers you look as good as granite at an affordable price. As quartz stone is manufactured, you have the choice to get it made in the appearance of your choice and you can select the design elements on the slabs and they can be produced with the colours, patterns, and texture that you might want in your kitchen. If you are going to compare the durability of the quartz countertops with the other stone options like granite and marble, then they offer you a far more durability than two of them combined. As the main material in quartz is 92% of the natural quartz stone with the 7% of the resin binder. This makes them extremely tough and durable. You also have a choice to get them in the thickness of your liking. Quartz countertops also have a non porous surface and this makes them very hygienic too. As they are really smooth, you don’t have to worry about spills and scratches on the surface and they also don’t need to be sealed from time to time. So if you are someone who is very careless, the quartz countertops are the perfect choice for you. You also don’t have to worry, even if you are keeping the eatables directly on the surface as they are non porous and this prevents any bacteria formations. Before getting the quartz stone, make sure that is certified by National Sanitation Foundation as a safe countertop. 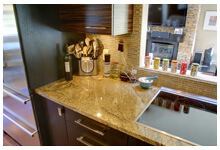 Before you select the quartz countertops of your choice, make sure that you are getting them from a good retail shop. Always compare the prices to get yourself a good deal. You also have to make sure that you are getting them installed by the professionals, as like the granite countertops; they too need to be installed in a right manner to avoid any gap in the base as it might result in the air pocket and cause the countertop to develop a crack. Professional installation will ensure that you are not having any such problems in the future.